Board index Facebook Fridays! - Free LMCCo Product Giveaways Every Week! 2014 Facebook Fridays! It's Friday, February 21, 2014, and time once again for Facebook Fridays! This week's theme is Compelling. Is someone resisting your wishes? Failing to carry out your requests? Hiding the truth behind a wall of vacuity? Compelling products may be the answer: Use them to make that person to do what you want and tell the truth when asked! Four lucky winners will each receive one of our signature Compelling products. The big winner gets a complete Compelling Spell Kit. Our runner-up receives a Compelling Mojo Hand. Winner number three will get a Fixed and Dressed Compelling Vigil Candle. 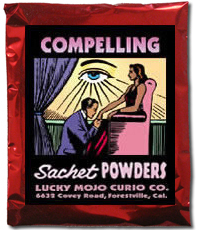 And winner number four will receive a packet of Compelling Sachet Powder. All you have to do to enter is to go to the Lucky Mojo Facebook page, scroll down, and post a comment to the Facebook Fridays! status message for February 21, 2014. First thing tomorrow morning, we will select four winners at random, announce their names here, contact them via Facebook to get their mailing addresses, and send them their FREE Compelling products. We have a winner! In fact, we have four lucky winners! Our Facebook Fridays Giveaway winners for February 21, 2014 are: Rebecca Barker, Victoria Hendrix, Kenneth Gunter, and Joseph Furuyama. Thank you, Ernie! 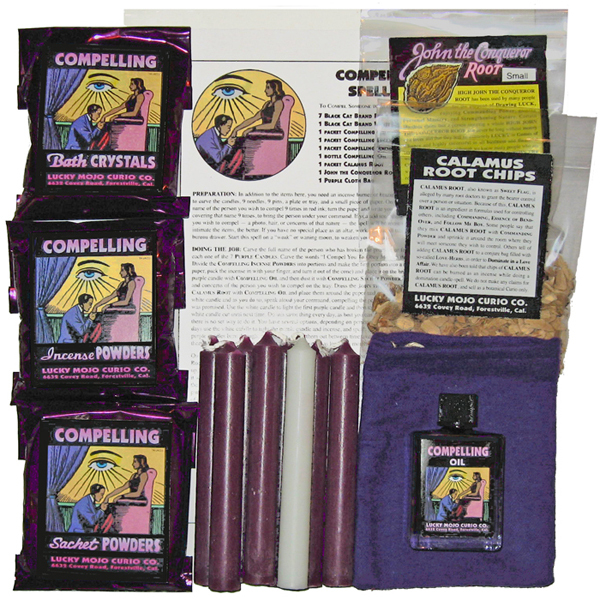 This is a very cool spell-kit and a great prize for the lucky winner!